Thank you for taking the time to e-mail me about the issue of Train Safety. Can I say that this is a dispute between Merseyrail and the RMT Union. I am happy to use whatever influence I have to try and settle the matter but I am unable to instruct either party to come to an agreement. The contract for new rolling stock was signed prior to my election and I respect that decision. The contract for over £460m of investment in new rolling stock, means our trains will be the most technologically advanced trains in the country. The business case was predicated on the driver having responsibility for opening and closing doors. I too hope that a settlement can be reached asap as we need stability in our transport systems throughout the Liverpool City Region and we would not wish to imperil any investment in the future. I have stated publically and in private to the RMT Union leaders that my door is open should they wish to meet to progress the issue and work to find an agreeable solution to the current impasse. Whilst Steve Rotherham is right in saying that the dispute is between Merseyrail and the RMT Trade Union my clear understanding is that the dispute was in reality created by Merseytravel, the public sector Transport Committee of the Liverpool City Region. By this I mean that it was Merseytravel who ordered the new fleet of Stadler trains which are intended to be run without train guards. 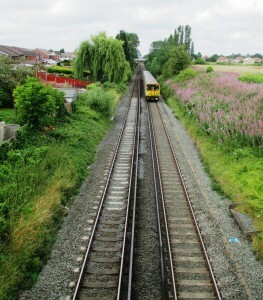 Merseyrail, the private sector train operating company, could be said to be in a dispute that is not of their own making. They may well be fronting up like they are up fight with the RMT Union but did they have any choice in reality other than to do battle with the RMT? My view is no they did not have any choice because the politicians who sit on the Merseytravel Committee dropped them right in it when they decided to axe train guards on the new fleet of trains. This still looks to me like a dispute created by politicians but left to the private sector rail operator to fight. It seems to have been rather obvious for a while now that Anderson and Rotherham have a problem with each other; one is the elected Mayor of Liverpool the other the elected Mayor of Merseyside. The other obvious question is why because they both come from the same political party – Labour. It strikes me that the mayoral quarreling, as described by the Liverpool Echo article, is not going to be in the interests of Merseyside and the Liverpool City Region. If they were from differing political parties you could almost understand it and you would expect some friction but they are not. Do we need an elected referee now? I had an enjoyable trip down to Prescot this morning to see Carl Cashman, the Lib Dem candidate to become Mayor of the Liverpool City Region, launch his manifesto. The venue was packed out and I only just managed to squeeze in. Some great green policies and a realistic approach to housing need too. First time I have heard a senior politician acknowledge that environmental, planning and housing policy needs to be joined up rather than the present daft system where they are not joined up at all. 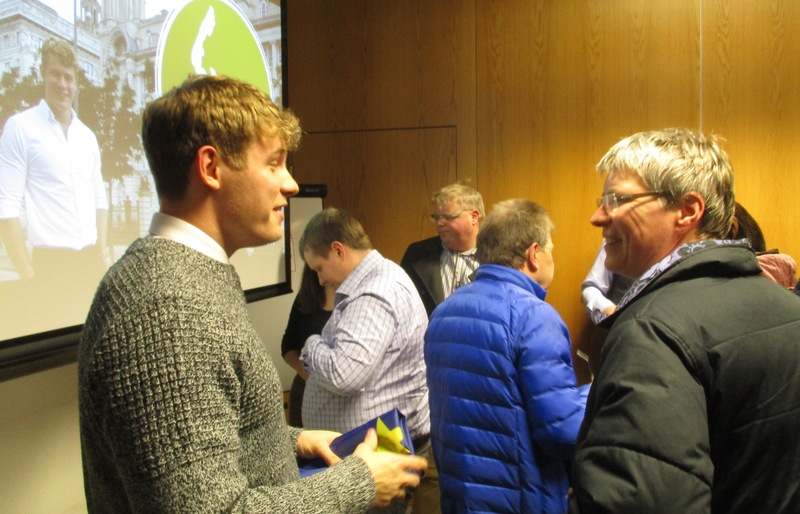 Carl’s backing for a tidal lagoon off Southport to produce clean energy was very welcome news. 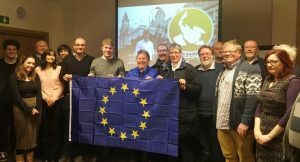 He also spoke about the mad situation in the Maghull & Lydiate part of Sefton Borough where the very highest grades of agricultural land (the land that grows our food!) are to be built upon because of Labour-led Sefton Council’s Local Plan. 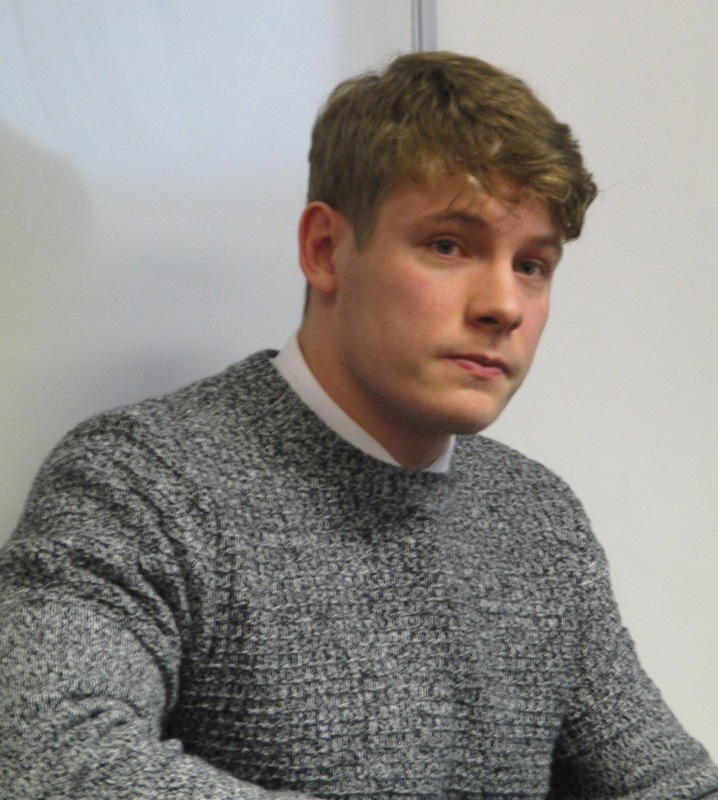 Carl is big on tackling disadvantage and poverty. 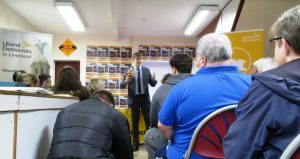 He majored on buses and the need to stop the decline in local bus services which he obviously sees as being a big issue for those on low incomes who can’t afford to run cars. And on low incomes he wants to bring in a Merseyside Living Wage of £8.50 per hour which Merseyside employers would be incentivised to support. Nice to see someone who really wants to tackle poverty rather than just manage it. 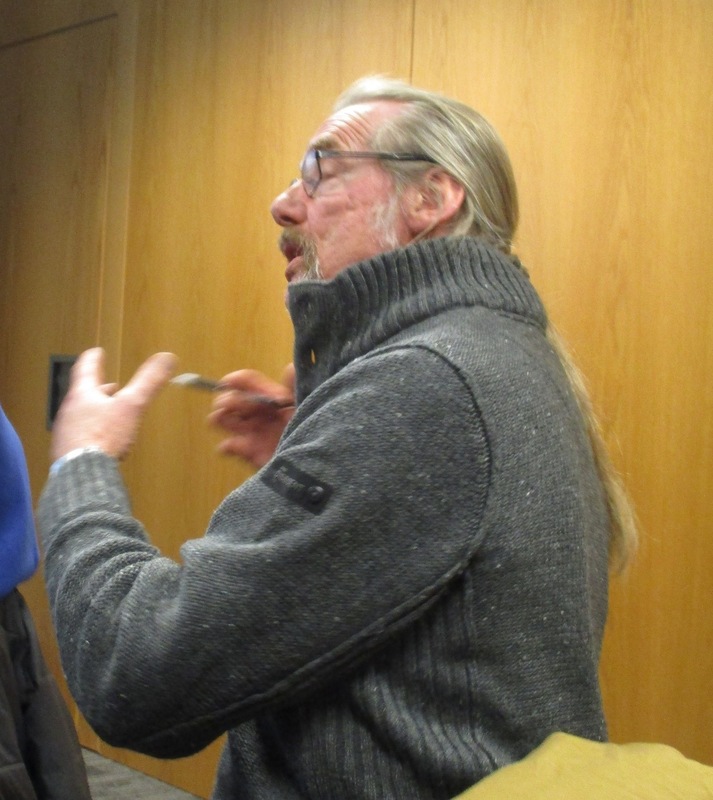 What also struck me was the support that Carl clearly builds from virtually everyone who meets him particularly people who have previously felt that they did not have a voice amongst politicians. As I have said before this young man is going places. 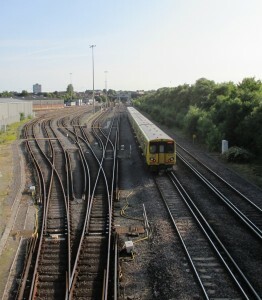 Merseyrail’s Kirkdale Motive Power Depot with Kirkdale Station in the background. Merseyrail, as I understand it, applied for an injunction to stop today’s rail strike on the network on the basis that the decision to implement new trains (which will run without guards) was taken by the Liverpool City Region Combined Authority and, as such, Merseyrail had no choice but to implement the plans. Merseytravel (a Committee of the Combined Authority), I understand, responded by saying that they were aware of the injunction, but that the injunction was a matter for Merseyrail as the employer of the staff represented by the RMT. The Merseytravel Committee is the public sector body which originally made the recommendation to order new trains that would not require train guards to operate them. That recommendation was then endorsed by the Liverpool City Region Combined Authority. However Merseyrail, the private sector franchisee, which presently operates the Merseyside rail network (and will continue do so after the new trains are delivered) has in effect been forced to enact the decision which has caused its RMT Union employees to go on strike. No wonder Merseyrail are upset as they at face value they are the victims of the decision making process just as much as their train guards. I don’t think you could make this all up, could you? 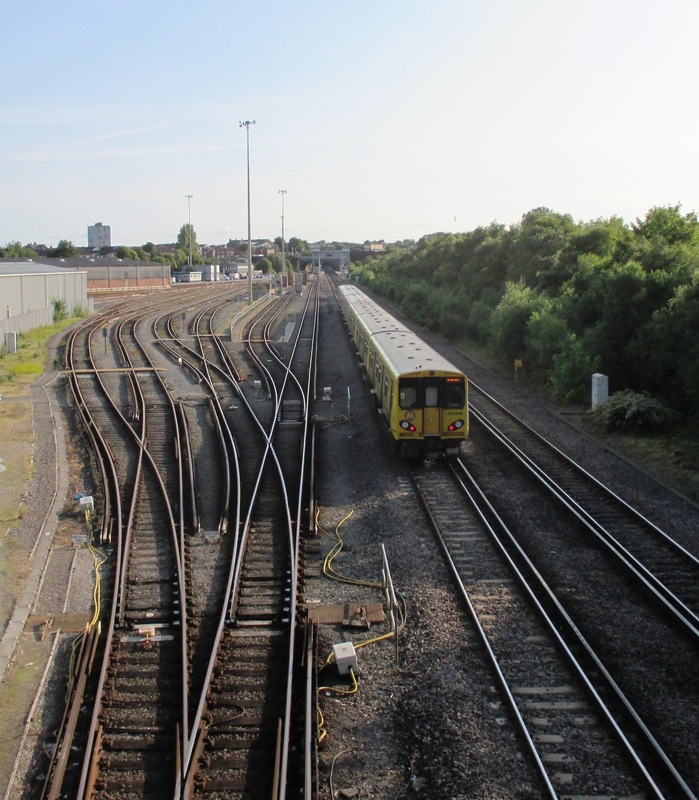 A new web site has been launched to chart the progress of the investment in our local rail network – see the link above to access the site and learn more. Site for the new Maghull North Railway Station. Photo taken looking north from School Lane road bridge. The former Moss Side Hospital site is to the right and Mersey Avenue to the left. The new Maghull North Station gets a mention with work starting in August 2017 and a planned opening of the Town’s second railway station in May 2018. Some of us have be campaigning for this second station for more years than we care to mention! Great to see it on track! 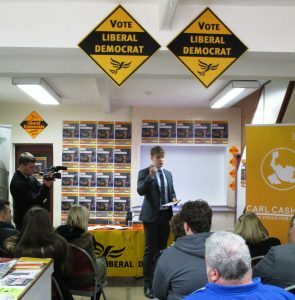 Jen and I went to a campaign meeting for Lib Dem Mersey Metro Mayor candidate Carl Cashman last night in Liverpool’s Central Library. This was the view from from Central Library of St. Georges Hall. What a venue, this modern recreation of the library is wonderful; what a great place to meet. 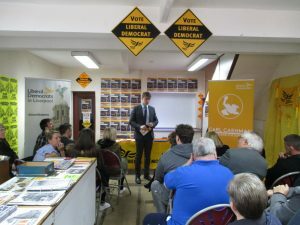 It was a good meeting with a great cross-section of Lib Dem supporters, particularly good to see young people there too. Really nice to meet up with Fred Weavers, Nigel Ashton, Ian Smith, Phil Gilchrist and many others again. Hardly young (sorry Fred) but redoubtable environmental campaigner and Southport Lib Dem councillor Fed Weavers was there speaking passionately about all things green at the meeting. It’s already clear that Carl will be pressing home his advantage over Labour in a number of key areas. He’s firmly pro-EU and Merseyside voted to Remain. Of course Labour was Pro-EU but now it is backing Teresa May and UKIP’s Brexit! He is also big on green issues and Labour’s record on Merseyside of allowing Green Belt and the highest grade of agricultural land to be built on is terrible indeed. Carl discussing the issues of the day as the meeting closed. There’s more to come from Carl, a young man who is fast building a core of support for his fresh approach to politics. Not surprisingly Carl is doing very well with young voters who are walking away from Labour because of its support for Brexit. I have watched Carl grow myself and he’s quite a contrast to the tired old type of politicians who turn voters off. What’s more he is already Leader of the opposition on Knowsley Council. Watch this young man go places.